We recently celebrated my niece’s 4th birthday, which prompted me to look through some pictures of her 3rd birthday. 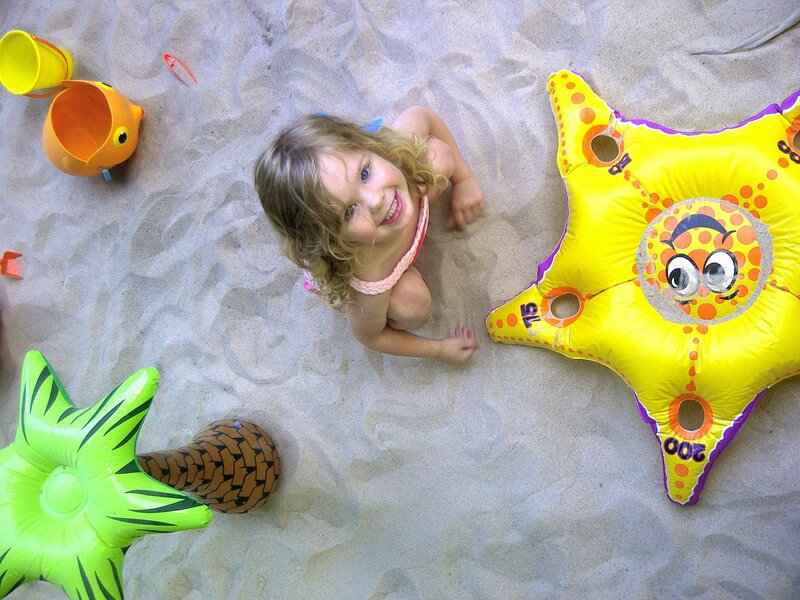 We threw her a really big “Beach Bash” themed party and I thought I’d share some of it here to give you some ideas if you’re throwing any parties this summer. 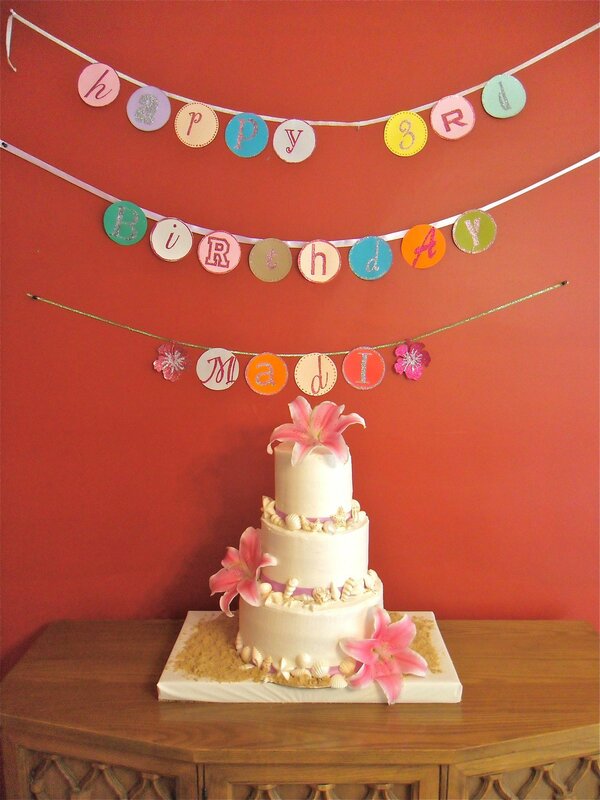 I like the idea of a beach theme because it’s so easy to find supplies during the summer months and it can be used for birthdays, anniversaries, holidays, etc! Obviously we had this party before I started this website so I didn’t take nearly as many pictures as I would’ve liked and the ones I do have were mostly snapped on my blackberry so I apologize for the quality. 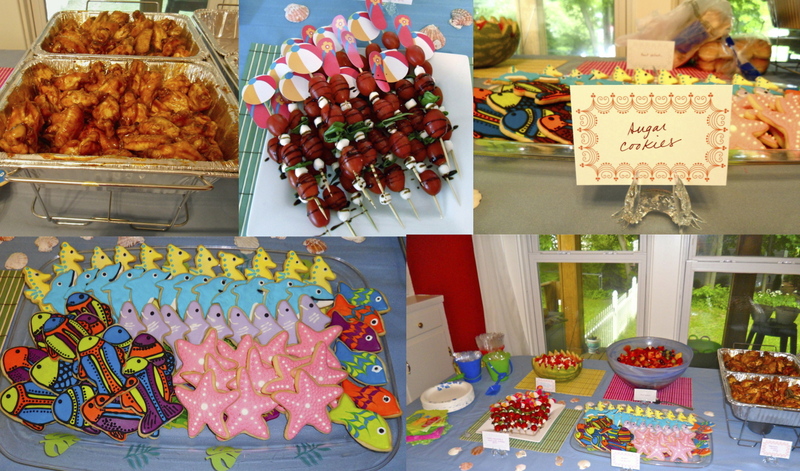 We had such a great day at this party (my niece still asks my dad where her beach is every time she goes to my parents house) and the possibilities really are endless for this kind of a theme! I wanted to do really unique invitations for this party and since everyone we were inviting lived in town, I knew I could get even more creative because I didn’t have to mail them. I bought these miniature metal pails from Target’s 1$ bin but I see this year they have them all over the place! I decorated the outside with foam stickers in different sea creature shapes. Since mine had cutouts, I lined each one with card stock to keep the sand from spilling out. I used play sand we bought at home depot, much more of which we’ll use later! 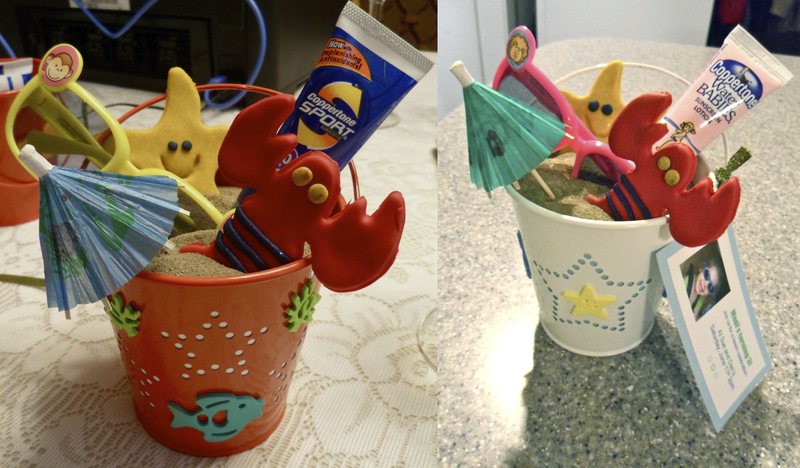 I made lobsters and starfish out of air-dry clay and cutters from a Play-Do kit. I put those in the sand along with plastic sunglasses from the dollar store, mini tubes of sunblock (look in your store’s travel section) and little drink umbrellas from Party City. I took a picture of my niece wearing some bright colored sunglasses and used that to make little tags that hung from the pails with all the details for the party. We had the party at my parents house and their house has a perfect lay-out for this kind of party. Their dining room is right off the kitchen and at one end is sliding glass doors that lead right out onto a double-tiered deck and a big back yard. We started out by clearing out the dining room to set up the food, desserts and the bar. We lined card tables along the three walls and covered them with tablecloths and seashells. I got bamboo placemats from Target’s 1$ bins and all the food went on those. The plastic silver ware was put out in plastic sand pails and we got beach themed plates and napkins from Party City. We didn’t serve too much food because a lot of our guests had other parties to go to that day so we kept it to a minimum. We had Hawaiian chicken wings (recipe found here), Caprese Salad Skewers, a watermelon and feta salad, a fruit salad, and then I made sea-themed sugar cookies. To make the skewers for the caprese salad, I bought a big bag of beach ball and flip flop cut outs and glued them to the ends of wooden skewers. We got glass sea creature place card holders from Pottery Barn for our wedding so we used those to show what each food was. The cards were printed from a template found here. To make the watermelon salad I hollowed out a large watermelon, cut the flesh into cubes and tossed it with feta cheese, chopped fresh mint and a little olive oil. I cut the hollow watermelon in half and cut a zig zag design around the top and served the salad in that. On the perpendicular to the food table, we set up a bar (not pictured). We had buckets of frozen margaritas and daiquiris, and a Wave Station blender that will turn any liquid into a be achy frozen drink. On the table directly across from the food table, we set up the cake that I made and hung a glittery banner. To make the banner I just printed out each letter in a different font onto different colored card stock. I traced around the letter with the top of a glass to get the circle shape. I traced each letter in glue and then glittered it with different colored glitters and did the same thing for the borders. Once all the letters were done, I glued the circles to long strands of ribbon which we just tacked to the wall. The cake was way over the top, I’ll be the first to admit it but I wanted to make something really special for my niece. Each of the three tiers is 3 layers of a rum spiked vanilla bean cake filled with a passionfruit curd and iced with a rum buttercream. 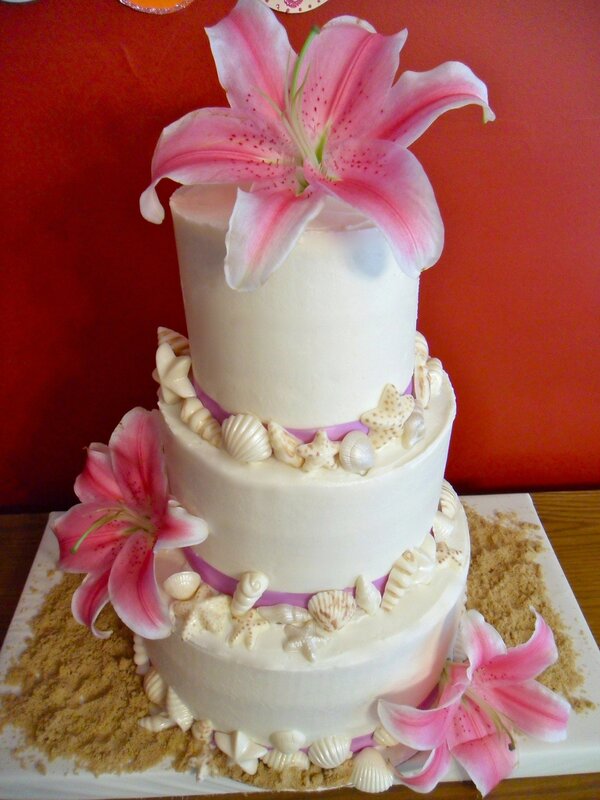 I then put a lavender ribbon around the bottom of each tier and covered it with handmade white chocolate seashells. I used candy molds, painted some texture on with milk chocolate and then filled them with white chocolate. When I popped them out, they looked just like real seashells. I scattered brown sugar around the base to look like sand and then ordered these lilies from our florist. Make sure you ask them to include the plastic capsules full of water on the ends of the lilies so you can stick them right into the cake. Outside, I had my dad build a beach (okay more like I kept bothering him until he agreed to it! Lol) and I think that was my niece’s favorite part. We put down a huge piece of plastic sheeting in the middle of the yard and then layed down several 50 lb bags of sand over it. 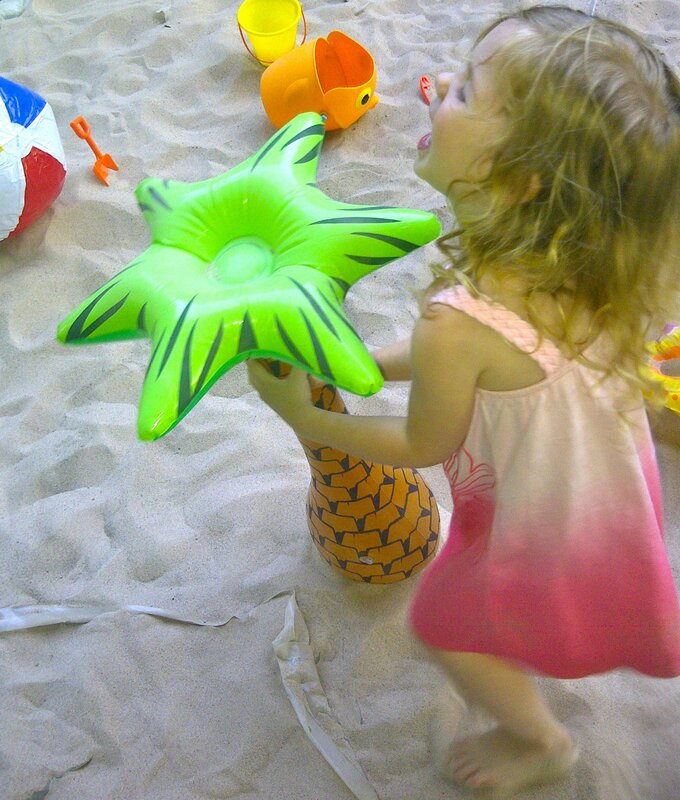 I got sand pails, shovels, molds, blow up palm trees, etc and we scattered those in the beach. We set up a water table, a couple kiddie pools and some beach themed games around the rest of the yard. 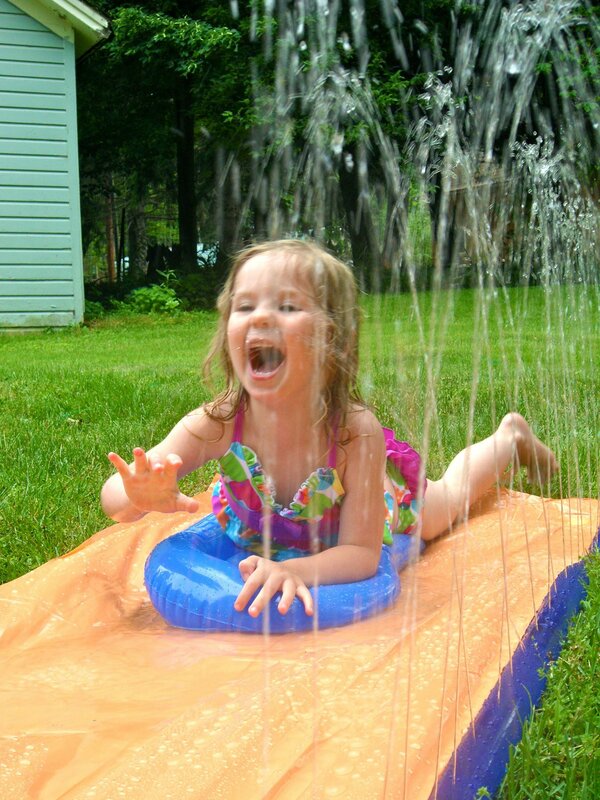 We also had a slip-n-slide which my niece got a kick out of! We bought silly sunglasses and had them out on a table with leis and hair flowers when people came in. Once we started, we could have never stopped… that’s how many possibilities there are for this kind of theme!